Eden believes she's finally found a man of honor and integrity. But when the truth about Levi's prodigal past comes to light, can this tarnished hero find a way to win back the librarian’s affections? 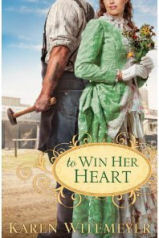 If you would like to read the first chapter of To Win Her Heart, go HERE.